BLAIRSVILLE, Ga. – At their Tuesday, June 5, meeting, the Blairsville City Council heard from Clay Pilgrim, of the accounting firm Rushton & Company, who presented the city’s financial audit for fiscal year 2017. 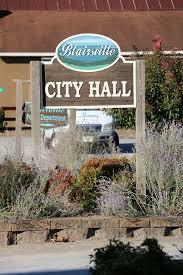 Pilgrim explained this was the first year that Rushton & Company conducted an audit for the city of Blairsville. Pilgrim went on to state the city’s total net position for 2017 was $23,429,812. “That’s going to be your capital assets – buildings, equipment, land – less the depreciation on those assets, less any debt that’s outstanding that was used to acquire those assets,” Pilgrim explained. Concerning the city’s general fund, Pilgrim stated revenues decreased in 2017 by 8.8 percent for a total of $152,615. “A couple of causes there – fines and forfeitures decreased about $29,000 and intergovernmental revenues decreased $139,685 largely due to LMIG (Local Maintenance and Improvement Grant) and timing there on when those are spent,” Pilgrim said. Expenditures, however, also decreased $214,354.00, approximately 14.7 percent than that of 2016, and the ending unassigned fund balance, or reserves, for the city stood at $2,489,042 as of Dec. 31, 2017, according to Pilgrim. Following Pilgrim’s presentation, Councilwoman Mary Ruth Cook commended City Clerk Kaye McCann and Acccounting Clerk Joan Manheim for their assistance to the auditors. To this, Manheim also thanked all of the city department heads for their participation in the audit. “I’m very appreciative of the trust you put in us, our firm, to do your audit,” Pilgrim stated. “Well, we appreciate you and your team, Clay,” Mayor Jim Conley told Pilgrim. The council also approved a reimbursement amount to Union County for an accounting error going back to 2009. Since that time, Manheim explained, a utility bill from Blue Ridge Mountain Electric Membership Corporation (BRMEMC) for a sewer lift station at the airport has continued to be sent to the county. Manheim explained the error was discovered after BRMEMC refused to provide the city information about the meter at the lift station, since the meter number was not registered to the city. Upon investigation, BRMEMC determined the meter was erroneously registered to the county’s Recreation Department. Manheim further explained the city has made a request to BRMEMC to update all of the city’s meter numbers. In addition, Mayor Conley said the total amount the county has paid to BRMEMC since the error originated has amounted to $10,784.20. “Lamar (Paris, sole commissioner of Union County), when I met with him, he said, ‘If you all pay us half of it, we’ll be satisfied,’” Mayor Conley explained. The council unanimously agreed to pay $5,392.10 to Union County as reimbursement. In department head reports, Darren Harper, of the Downtown Development Authority, reminded the council that this Thursday, June 7, is Shop Late Thursday for the month, during which downtown businesses will stay open later in the evening to allow potential patrons who cannot come downtown during the day a chance to visit and shop at downtown businesses. Harper also gave a report on a forthcoming property off of Pat Haralson Drive. Harper said the three-story building would consist of two floors, at 4,000 square feet each, of retail space and a third 4,000 square-foot for residential space. Police Chief Johnny Carroll reminded the council and those present the new hands-free driving law for the state of Georgia will go into effect on July 1. This law prohibits drivers from holding their cell phones in their hands while driving. Drivers will now be required to use a hands-free device or system to access their phones. In other business, the council approved the purchase of a Kubota zero-turn mower from Nelson Tractor in the amount of $12,157.28 for the Blairsville Airport. Funds from Special Purpose Local Option Sales Tax (SPLOST) will be used to finance the purchase. The council approved a new work detail agreement for fiscal year 2018-19 with the Georgia Department of Corrections in the amount of $39,500 for the year. Councilwoman Cook mentioned the need for a crosswalk and/or pedestrian crossing signage on Pat Haralson Drive near the Downtown Develoment Authority property and Millie’s Corner Plaza. The council agreed that signage would be the best and most expedient option, and Mayor Conley told Cook pedestrian crossing signs could be installed as early next week. BLAIRSVILLE, Ga. – At the Tuesday, May 1, Blairsville City Council meeting, Michael Collins, owner of Michaelee’s Italian Life Caffe, spoke to council members during public commentary about the parking situation in downtown Blairsville. Collins described parking in the downtown area as a problem that is “getting worse.” The restaurant owner explained he was told in 2014 that the city was would be working to improve parking but stated as of yet, he has seen no significant results. When Collins asked the council about the gravel parking located behind his restaurant and adjacent to City Hall as well as the grassy area situated between the gravel lot and the exit/entrance for the state Route 515 and Pat Haralson Memorial Drive interchange, Mayor Jim Conley informed Collins his customers and employees were welcome to park and told of the city’s plans to develop the area in the future. “Parking is a nightmare for every town,” Conley added. Councilman Tony Dyer, who expressed the need to develop the lot at the March city council meeting, again stressed the need for an immediate resolution by utilizing the property and space. After this, the meeting briefly resembled an impromptu town hall forum, as several downtown business and property owners present at the meeting offered their insight and thoughts on the situation. Bill McGlamery, owner of The Wine Shoppe, expressed concerns over liability and the safety of the gravel lot, also located behind his business. McGlamery pointed out the lack of adequate lighting and stated the gravel surface posed safety issues for elderly downtown patrons. Regina Garrett, owner of Cut Loose Beauty Salon, suggested that although use of the gravel lot would open up more parking for downtown, patrons, she felt, would be unwilling to walk the distance needed to reach certain businesses in the downtown area. Another downtown property owner, Millie Arrowood, told of overflow parking problems with people parking in certain businesses’ parking lots but frequenting other establishments downtown. Colleen Urbaniuk, owner of Season’s Inn, agreed with this sentiment, saying this certain problem forces business owners to “be the bad guy” by disallowing people to park in the lots at which they are not patronizing. After further discussion, Mayor Conley addressed Darren Harper, supervisor of the Downtown Development Authority (DDA), and told Harper the DDA would need to develop a grading plan for the gravel lot before the council could move forward with plans to develop the lot. In other business, Chip McGaughey, of EMI, told the council of the need to install a grit removal system at the city’s wastewater treatment facility. McGaughey stated the city could be eligible for a Georgia Environmental Finance Authority (GEFA) grant to assist with the purchase of the removal system. Overall, McGaughey said, the total cost estimate for the system would be approximately $800,000 and the GEFA grant could offer as much as $200,000 in principal forgiveness. The remaining $600,000 could be financed through a loan, McGaughey explained, and stated the city would have to decide on either a 10-, 20- or 30-year term for the loan. According to McGaughey, the deadline for the GEFA grant is June 1. When Dyer asked if the grit removal system would be money well spent for the city, McGaughey stated the system would prevent breakdown of equipment caused by grit build-up and added that no chemicals would be involved with the removal process. The council voted unanimously for McGaughey to proceed with the application process for the GEFA grant. In department reports, DDA Supervisor Harper told of the success of the Explore Blairsville Georgia mobile app. Harper reported, as of the meeting, 491 active users had signed up for the app. Also, Harper stated the monthly Shop Late Thursday event, in which downtown businesses stay open from 5 p.m. to 8 p.m. on the first Thursday of every month, has been “warmly received” by patrons who are unable to shop downtown earlier in the day. Blairsville Assistant Police Chief Michael Baxter announced the Georgia Crime Information Center (GCIC) hotspot devices that were purchased during the March city council meeting have been installed in city police vehicles. The devices provide instant Internet access to the GCIC database and allow officers to access information of the vehicle and the recorded owner. Baxter stated since the devices have been installed, Blairsville officers were able to receive information on two wanted persons during routine traffic stops before approaching the stopped vehicle. In the Blairsville Airport report, John Damer, airport manager, introduced new maintenance employee Aaron Manheim and the council officially ratified Manheim’s hiring unanimously. In the council’s consent agenda, the decision to approve an occupational tax certificate for Just Cremation was tabled after Councilman Dyer expressed concerns over environmental health regulations with regard to crematories and potential adverse affects to the values of adjacent properties. The council agreed to table the decision to allow City Attorney David Barrett to research state guidelines regarding crematories.